There have been some working papers out that purport to show the demise of momentum. Financial blogs have picked up on this information recently and passed it along to a wider audience. But as we shall soon see, momentum may just be going through a Mark Twain moment in which rumors of its death are greatly exaggerated. Let’s take a closer look and see what’s really going on. “Are Momentum Strategies Still Profitable Work for U.S. Equity?” came out in October 2010. It showed that the mean monthly return from momentum during the five years ending in 2009 was -.163%. In contrast to this, the mean monthly momentum return from 1965 through 1998 was 1.14%, by the author’s calculations. Momentum returns were determined by going long the strongest and short the weakest 10% of stocks during the preceding six months. Positions were held for six months then readjusted. However, there are no statistical criteria, such as t statistics or p values, which might indicate any significance to these results. Nor are there any alternative momentum calculations, such as the use of different holding or formation periods. Finally, there is no exploration as to why momentum results may have changed over time. So there isn’t much to go on here. The second paper that challenges momentum came out in April of this year. It is called “Momentum Crashes”. In it, the author looks at momentum based on a twelve month formation period lagged one month. The holding period is one month before portfolio reformation. Top and bottom deciles are again used to sort stocks into momentum longs and shorts. Here the author identifies what has been going on under the surface. He shows there have been two major “momentum crashes” that have depressed momentum returns. The first occurred in July-August of 1932. The second was in Mar-May 2009. We see from this chart that if your analysis of momentum performance is for a short period of time (say the last five years that ends in 2009), results look lackluster. A single, rare event can seriously distort performance over a short evaluation period. Over a longer time frame, however, momentum still looks good. Furthermore, momentum returns are depressed during these two “crash” periods only because momentum is looked at from both a long and short point of view. The “crash” loses occurred on the short side during strong market rebounds following market declines with high volatility. During the 1932 “crash” period, past momentum losers rose by 236%, causing heavy losses as shorts, while past winners were up only 30%. Similarly, during the 2009 crash, past losers were up 156%, while past winners were up only 6.5%. However, most actual momentum investing is done only on the long side. If we look at how long only momentum did during these “crash” periods, we get an entirely different story. Long only momentum looks good here. For a longer term view, the folks at Dorsey Wright recently reported in a blog post called Momentum Over Multiple Cycles some long only momentum results using data off the Kenneth French website from 1930 through October 2011. Portfolios were selected based on being in the top half in market capitalization and the top third in momentum, which is similar to the AQR index methodology. Tracking ten year rolling returns from 1940 onwards, they discovered that the average ten year return of the momentum portfolios was 405%, versus 216% for the S&P 500 index. Momentum earned nearly double the rate of return of the market. 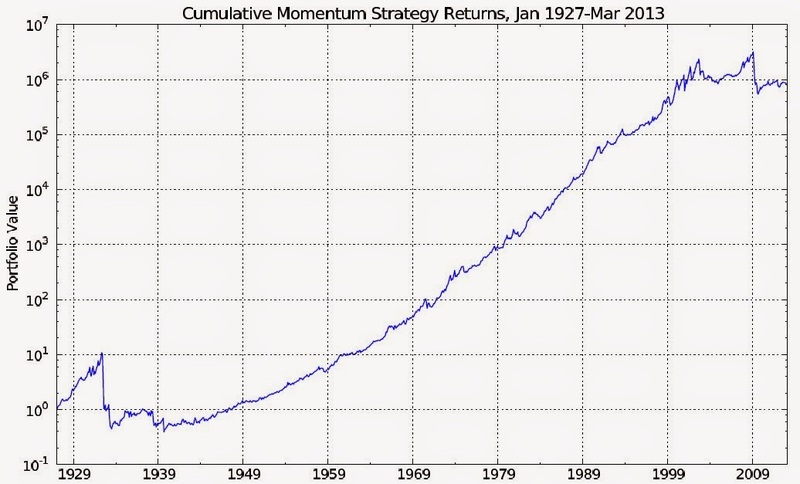 In every ten year period, including the most recent one, the momentum portfolio outperformed the market portfolio. But long only momentum has downside in the form of high drawdowns during equity bear markets. For example, the AQR equity index was down 49% from October 2007 through February 2009. However, as those who have read my research paper know, momentum applied to only equities is not the best way to proceed. During this same time period, our momentum portfolio using multiple asset classes achieved a profit of 18%. Momentum is still very much alive and well. Long live momentum!